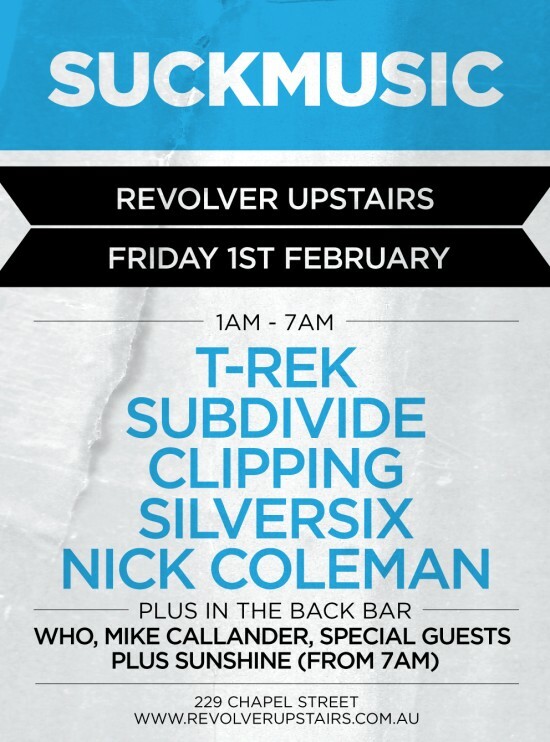 For our 16th party at Revolver we have decided to up the anti. Melbourne’s T-Rek will joining us for the first time on a Friday. A Revolver resident since the first use of the word ‘recovery’ we look forward to hearing what he has to say about all things music2013 and beyond. Subdivide (Ben Daffy) will also be making his debut for Suckmusic. We signed a killer tech EP from Ben last month which will be coming out on the label Feb 22nd. Clipping never fails to bring his A game to a Suckmusic party, we will see if we can get him to ok a live recording of his set.